Got Toilet Trouble ? Texas Master Plumber is Your Qualified Plumber! Got Toilet Trouble ? At Texas Master Plumber we serve the Houston Metro Area with residential and commercial plumbing. We can help you with all of your toilet troubles. Toilet troubles can be one of the most annoying plumbing issues you can have. It is 2:00 in the morning and nature calls. You do your business, flush and crawl back into a nice warm bed and you hear it…that dreaded noise. You lay awake for a few minutes hoping it will go away, and then you find yourself back in the bathroom doing the ceremonial jiggling the toilet handle to make the water stop running! Yes, we have all been there. Well, the fact of the matter is that most of these kinds of issues can be avoided with some simple maintenance of your toilet. In this article we will discuss some of the various issues that homeowners face with their toilets and some simple maintenance tips you can use to keep your toilets in tip-top condition. Of course, Texas Master Plumber is always on call to help you with your toilet trouble should you need us. As we mentioned already, the non-stop running water issue is a simple solution for the handy DIY types. It is relatively inexpensive to make these repairs but as the old saying goes, “an ounce of prevention is worth a pound of cure.” Let’s take a look at the cause and then focus on some tips that will help you resolve your running toilet woes. 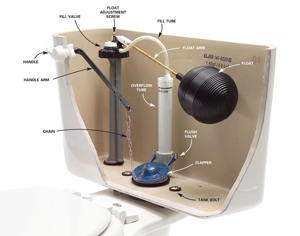 Usually a non-stop running toilet is caused by a valve inside your toilet that sticks. The fill valve that lets the water into the tank is not closing completely and allows the water to leak past the seal. This kind of toilet trouble can be from a faulty valve or a leak. If it were a traditional leak from one of the anchor bolts that holds your tank on to the toilet you would likely notice water pooling around your toilet. In many instances it is the flapper valve that allows the water to flush the main bowl that is the culprit. When this does not seal completely water continues to run out of the tank and the float does not get a chance to do its job and activate the shutoff valve. Other times it could be something as simple as adjusting the length of the chain to your flapper valve or simply adjusting the float adjustment screw at the top of the fill valve. If your toilet does not have a float adjustement screw, you can bend the float arm downward to achieve the same effect. Either way these are some simple things that you can look at before you give us a call. The key here is that your shutoff valve is engaged to stop the water from constantly running. If none of these toilet trouble techniques solve your problem the issue might be in the valve itself. Sometimes it is as simple as replacing a washer, other times it can require replacing the valve. If you get to this point and you need a qualified plumber, we are on hand to assist. Give us a call. As we alluded to earlier a plunger is a valuable tool to keep on hand when you have toilet trouble, but what if you are constantly having to reach for “old faithful?” There could be a more simple solution than you think, but is it worth the sacrifice? Many of the problems homeowners face with clogged toilets comes from the type of toilet paper they use. The triple-ply, double quilted brands that come with a comforter and two pillows may be the culprit. If you can settle for the cheaper brands and try not to use a tree every time you go potty, this might resolve your issue. But let’s say you are not willing to sacrifice in the toilet paper department. That’s okay too, it may not be the issue (although it could be a contributor). Another common issue is children. Yep, those wonderful, charming, little ones; the apple of your eye (that is until they flush an apple down your toilet). Even a plunger won’t solve these issues. In the event that a foreign object gets flushed down the the “old throne” removing the obstacle is your only recourse. You can use what is commonly called a “snake” or “auger” to feel your way through the anatomy of your toilet and free the debris. Worst case scenario is that there is a blockage in your plumbing that goes beyond the floor and your best recourse is contact Texas Master Plumber to come out and take a look at your plumbing to get you back up and flushing again. A common problem with toilets happens when you walk into your bathroom and your socks become a sponge! You’ve got a leak somewhere and you have to get it fixed quick before it causes damage to your walls, baseboards, cabinets or carpet. Usually the first thing that homeowners do is lift the toilet lid and look. Not sure why, but that is what they do. The next thing they do is look under the toilet tank. If they can’t find the source of the leak generally the male species of the house will grab a towel (one belonging to the female species and is an expensive decorative towels of all things) and quickly protects the homestead from further water damage. The source of this issue can be from several things: a toilet overflowed, a crack in your tank, a tank seal, or a wax ring seal issue. You might be thinking, “if it were from an overflowing toilet, don’t you think I would have recognized that?” Most people simply flush and walk away hoping that the toilet genie is doing his job while we are away and making the water swirl down the drain. In reality, the toilet may have overflowed, leaking water on the ground and when the drain clears the evidence eventually flushes away leaving you none-the-wiser. This is not as common, but it does happen. Another thing could be a physical crack in your tank or toilet. Sometimes these can be sealed with an apoxy, but we recommend in these cases that you replace the toilet. Another area where leaks can occur is in the tank itself. The screws used to mount the tank to the toilet can become loose, corroded, or the seals leak. These can be replaced relatively easily and require few parts. But the most common source is from a leak in the wax ring where your toilet seats to the floor. This can be a little more complicated and take some time and know-how to replace. If you have an hour or so to spare and want to make a trip down to the local plumbing supply or Home Depot, you can make these repairs on your own. We recommend that you Texas Master Plumber a call, and catch up on your email while we take all of your worries away. Sometimes it just easier and less aggrevating to call a qualified plumber who will make your toilet trouble look like childs-play. When you have toilet trouble you need a qualified Houston plumber. You need Texas Master Plumber. We are so confident that we can help you that we stand behind our work with a promise that we will get the job done right. We are backed by SuperPages. 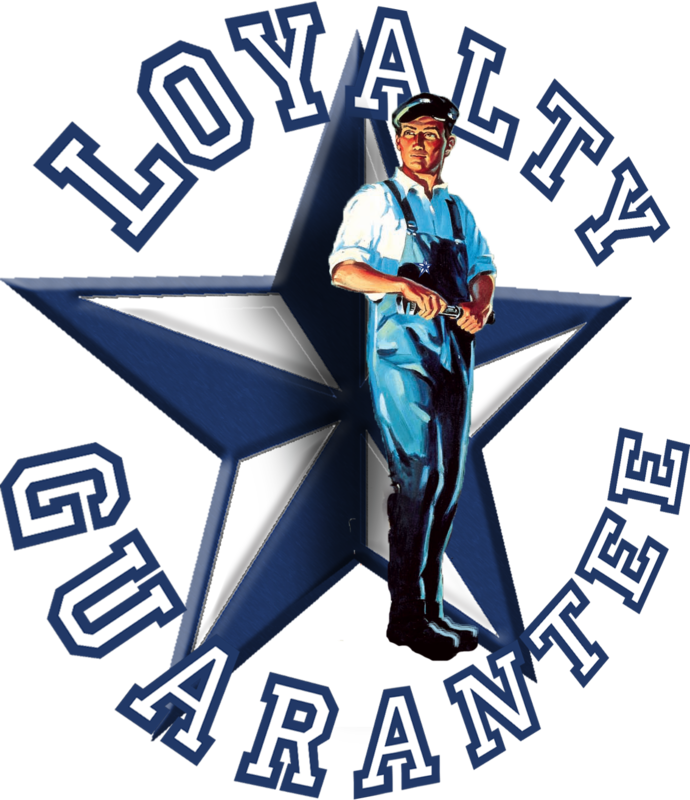 Our work is not only Guaranteed but SuperGuaranteed. If you have toilet trouble or need your toilet replaced, call Texas Master Plumber today.